Hi, this is Julie from Sprinkled with Paper. 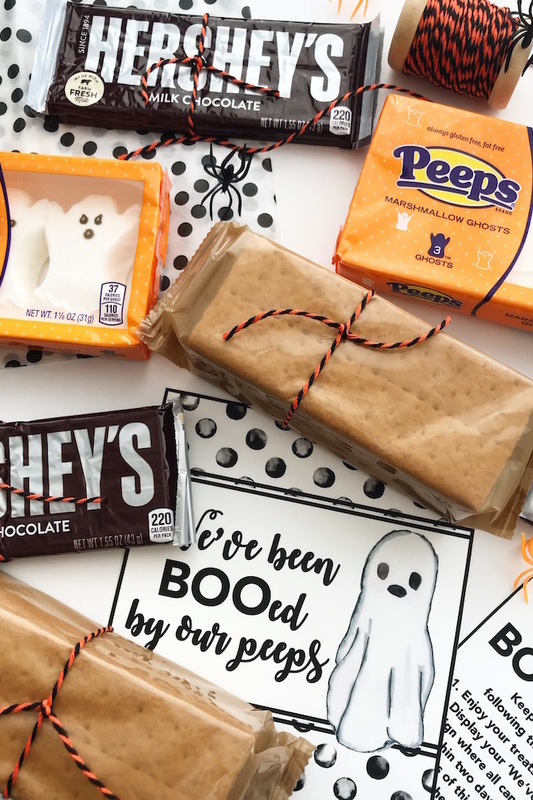 Today, I’m going to be sharing Spooky Halloween Boo S’mores Kits and one of my favorite Halloween traditions: “booing” our friends, family, and neighbors! What’s “booing”? It’s where you secretly drop off yummy Halloween treats or fun surprises and include a note with your delivery that encourages the recipient to keep the fun going by doing the same to at least two more houses. After being “booed”, you display a “We’ve been booed” sign, which is included with the treats, to let others know that you’ve been “booed”. Over the years, we have “booed” others in a variety of ways. One year, we delivered homemade Halloween cookies. Another year, candy apple kits. Last year, (and probably my favorite) we delivered supplies and instructions for a fun Halloween craft. This year, we’re going to boo our friends with spooky Halloween Boo S’mores Kits. To customize our s’mores for Halloween, we will be using marshmallow ghost Peeps. That way, we’ll be “booing” our peeps – so cute, right?! And, to keep the fun going, they get to “boo s’more of their peeps”. “We’ve been booed by our peeps” printable sign and instructions. 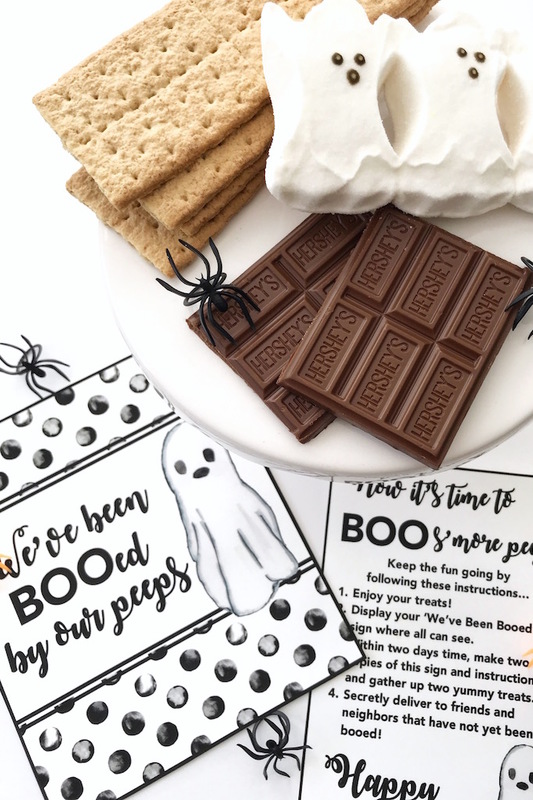 To make this year’s boo-kits extra special, I created a printable “We’ve been booed by our peeps” sign that will be included with the s’mores kits, along with instructions for “booing” others. I absolutely love making holiday-inspired printables. Since we’re customizing our boo kits to “boo our peeps”, I just HAD to create our own custom instructions. 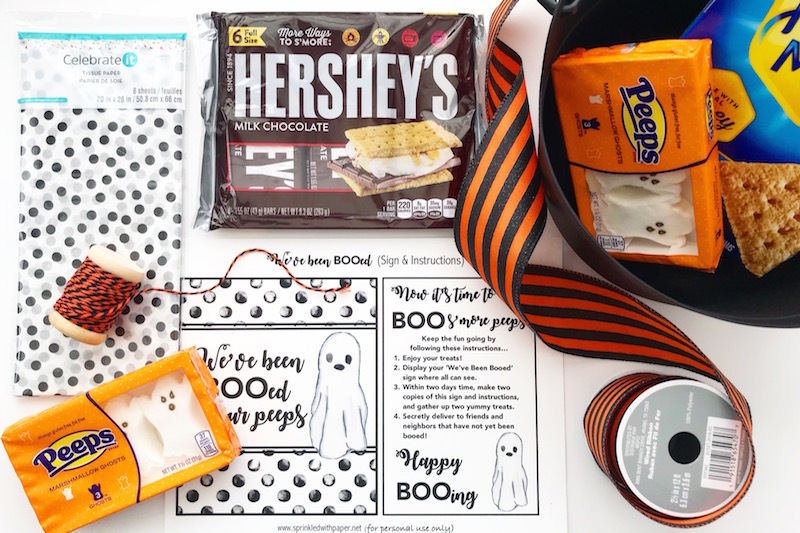 To complete your boo kits, you can download the free printable file here. Included in each s’mores kit are two (2) packages of graham crackers, four (4) Hershey’s chocolate bars, and two (2) packages of marshmallow ghost Peeps. This should be the perfect quantity for a family of four, so you’ll want to adjust your quantities accordingly depending on the family’s size. Step 1: Line bottom on the festive bucket with decorative paper. 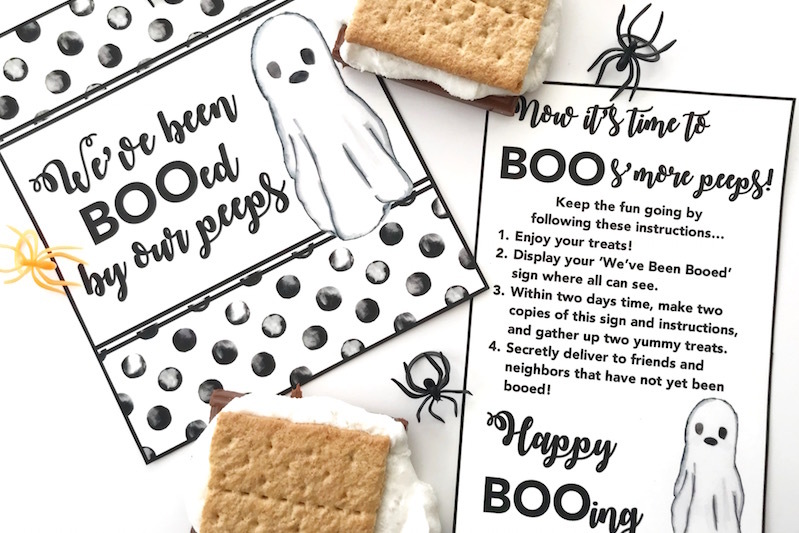 I used black and white polka dot tissue paper to coordinate with the free printable boo sign. Step 2: Tie twine around individual items, or package for a festive Halloween look. Step 3: Arrange items upright to ensure they are visible at first sight. 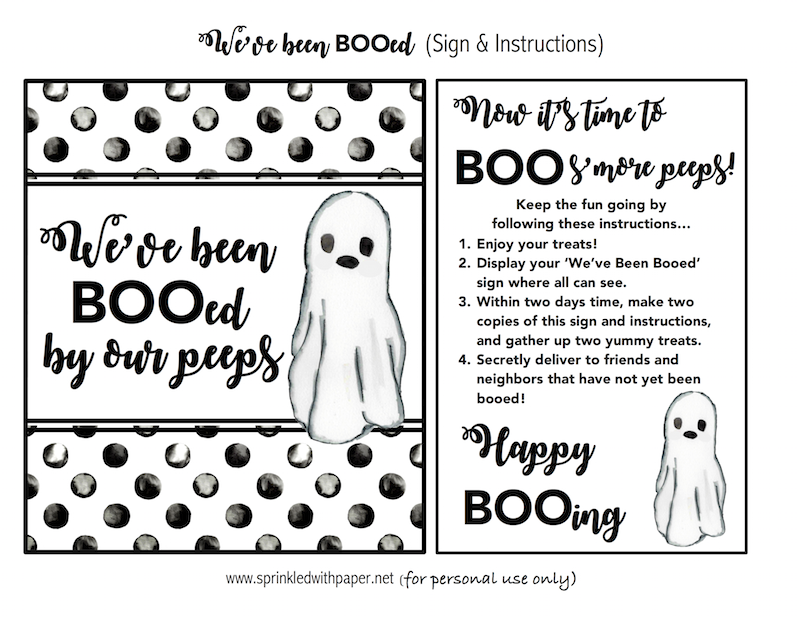 Step 4: Print free printable Boo sign with instructions onto bright white cardstock. Step 5: Place Boo sign and instructions in the bucket, making sure the “We’ve been Booed” sign is clearly visible. Step 6: Use ribbon to tie a bow on the handle of the bucket. Step 7: Secretly deliver to friends, family, and neighbors! After enjoying their Halloween s’mores, it will be time for them to Boo s’more peeps! I hope you liked my tutorial on how to boo your peeps. Please visit Sprinkled with Paper for more fun holiday and craft inspiration. Happy Halloween to you and your peeps! Hi Connie, sorry about that, the file did not properly load last night. I have fixed it and you should be able to access the file without issues, but if you are still not able to download the file please shoot me an email and I will make sure you get it! Great post. Fun ideas for me to do with my grand babies! What a fun idea! I’m going to do this for my friends and neighbors! Thanks for sharing! Thanks for the free printable! I absolutely adore this idea! We always buy a bunch of trinkets for our “boo” baskets. But I LOVE how this actually gets the family involved. Thank you so much Lisa! I hope you have fun BOOing your neighbors with this idea! Be sure to tag us on social media if you share so we can see how you use the printables too!